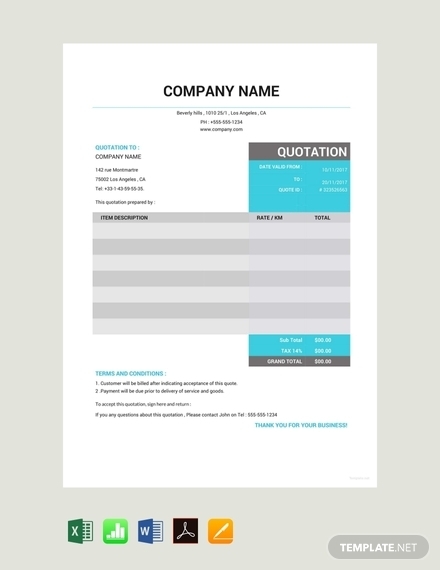 You want to attract new customers to your business by demonstrating professionalism through the documents you produce during tradings and transactions. One of which includes official quotations. Not only will this help you meet the needs of customers, but it will also protect your business from legal and financial disputes. 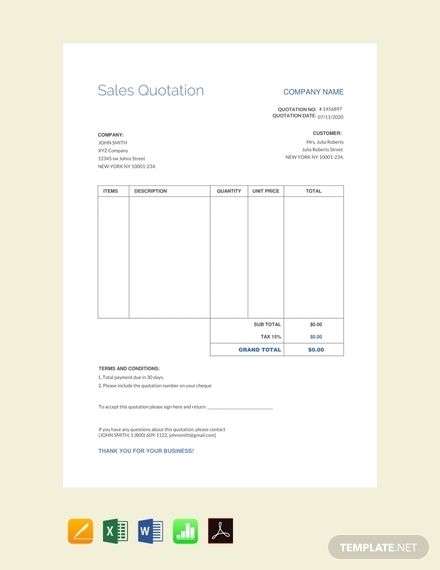 To successfully commit customers to a sale, a quotation must be written correctly. 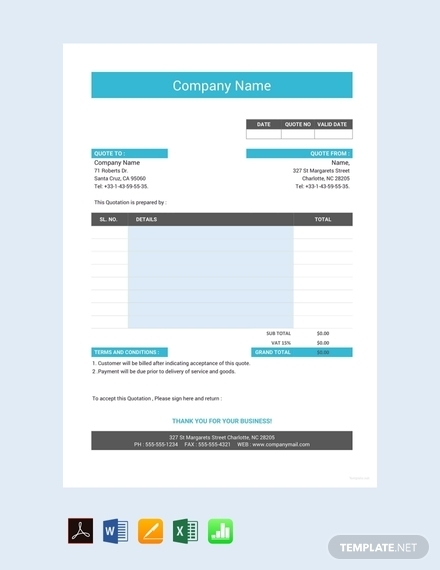 So in this article, we have provided a few guidelines and templates in Apple Numbers and other formats to help you out. 1. Business Information: For customers to be aware of who they are dealing with, remember to include key information about your company. This is a legal requirement that every organization must adhere to. 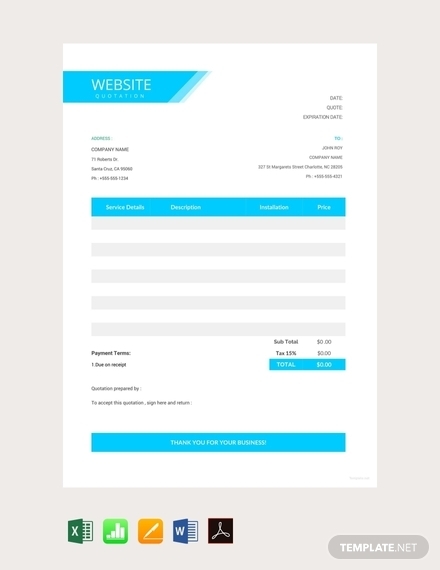 This includes your company logo, office address, and contact details. 2. 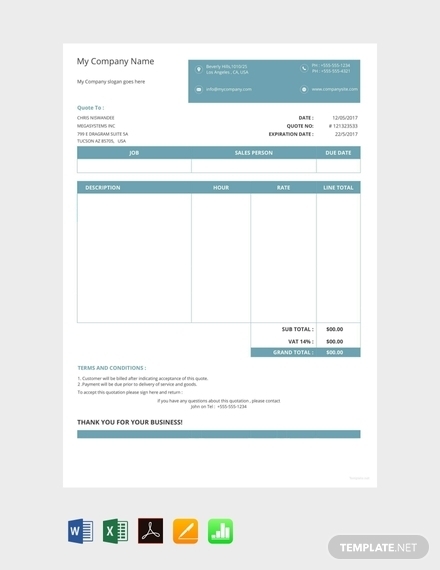 Total Costs & Breakdown of Costs: Always provide specific details of the job at hand along with an outline of what the costs will cover. The inclusions and exclusions of the job must be noted down carefully for customers to be aware of. It’s best to include a breakdown of these costs by describing the job proposal and components involved and itemizing the expenses for labor and materials. 3. Variations: There are several factors that may affect the cost of the job. Variations give you the opportunity to upsell your products or services by showing customers how they may benefit from the extra load. 4. Revisions: A quotation is simply a fixed price offer of what is needed. Once you begin working, you’re bound to encounter a few substantial changes in the job that were overlooked during the initial quote. Thus, it’s a good idea to make room for revisions when necessary. 5. Schedule for Work: Prepare a timeline from when you will start the job to when it is proposed to end. Keep in mind that you are contractually obliged to finish it by the target date, so make sure your work schedule is reasonable enough for clients to agree to. 6. Payment Terms & Conditions: The execution of a project is highly dependent on the financial resources provided by the client. 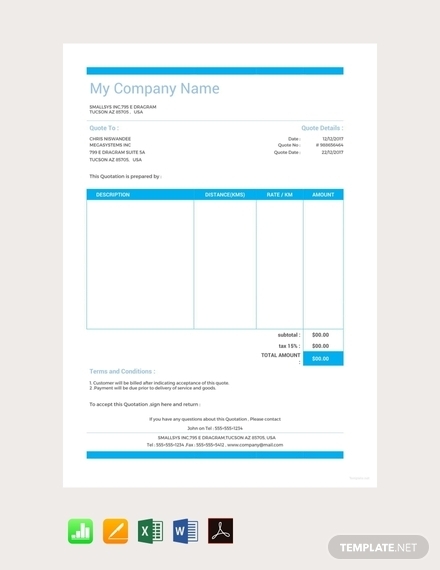 Some payments are made periodically, while others are settled half up front and half on completion. It’s important to specify when you require payments for clients to be aware. 7. 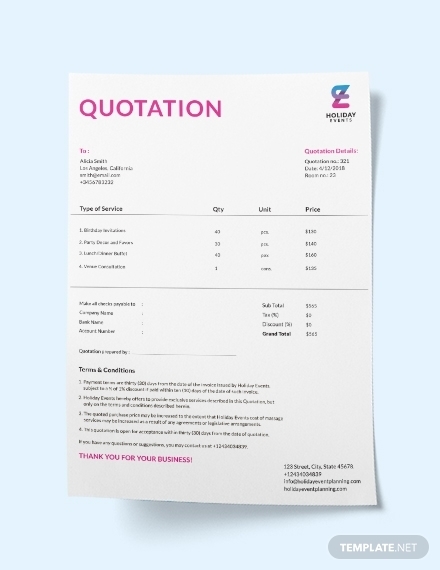 Quote Expiry Date: Sudden price hikes and drops are bound to cause significant changes to your quotation. For this reason, you need to let your clients know when you need a response by. 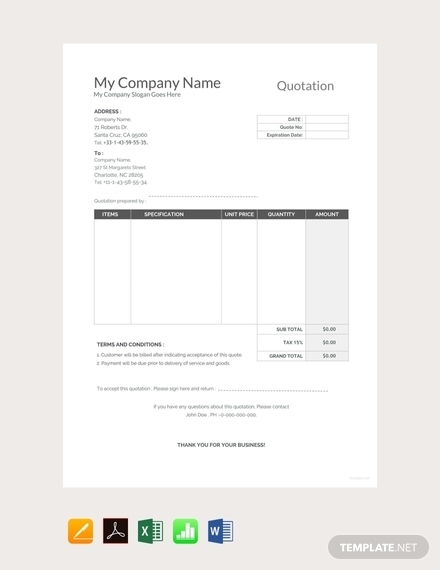 The expiry date will also encourage clients to read your quotation and make firm decisions. 8. 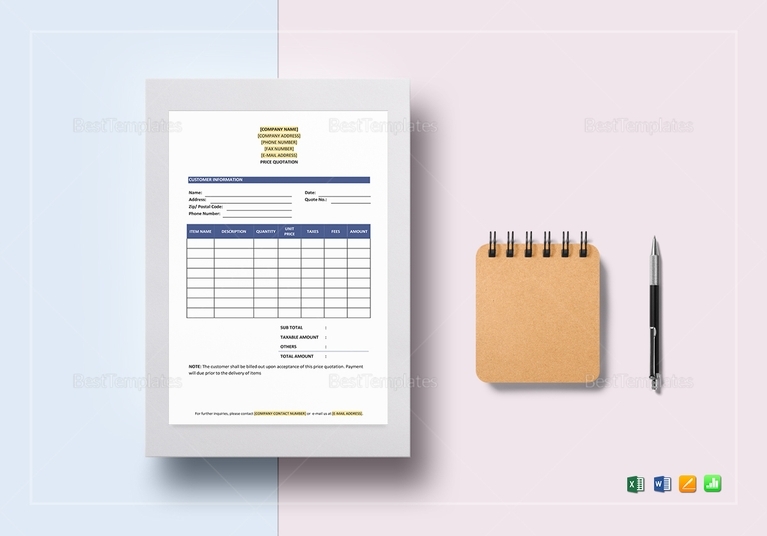 Customer Acceptance Signature: Because you have stated the terms and conditions of your business agreement, you need to make sure that clients have accepted them before you move forward with the project. 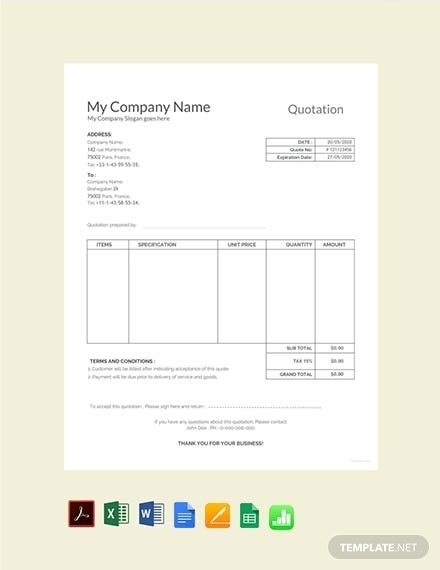 Include a section where clients can affix their signature and the date for when the document was signed. 9. Payment Methods: For project agreements that require a deposit at the quote stage, remember to state your preferred method of payment. This may vary depending on the kind of business you run along with the scope of the project. Common payment options include cash, check, debit, and bank credit. 1. 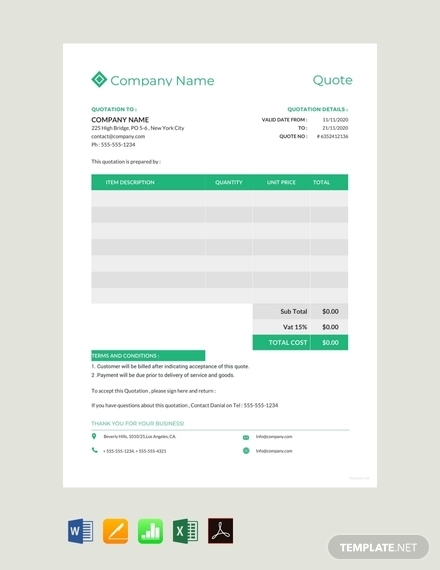 Quotation Header: The quotation header is comprised of a letterhead, document title, tax registration number, quotation number, quotation date, payment terms, and client name and address. 2. 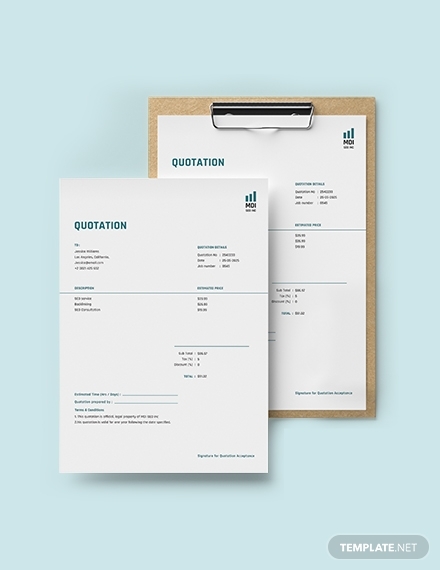 Quotation Body: When dealing with goods, you need to provide a detailed description of individual items. In the case of services, the project scope and amount for labor and materials must be stated clearly in the document. It’s important to be specific with your data to avoid any confusion or misunderstandings. 3. 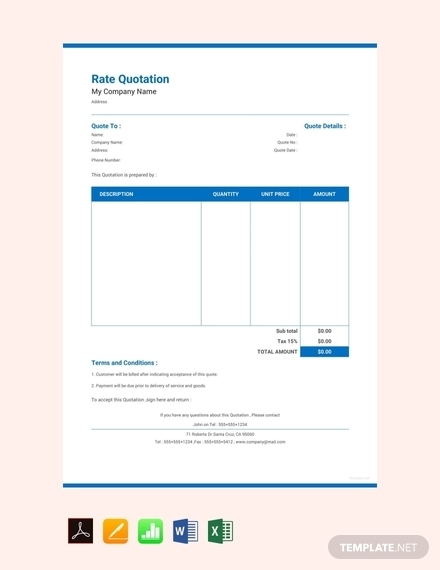 Quotation Footer: In the footer of the page, indicate the total amount of all individual items. Other comments and reminders may also be added for reference. 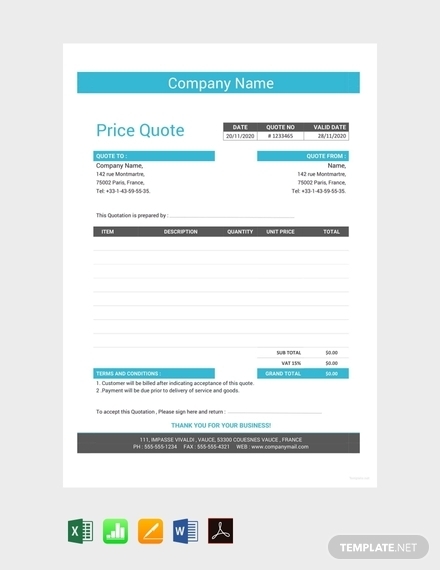 Like any legal document, it’s best to include an option for clients to sign and date the quote once accepted. 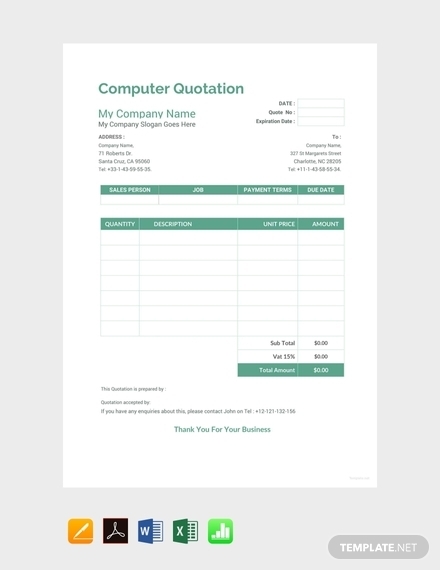 What is a quotation in business terms? 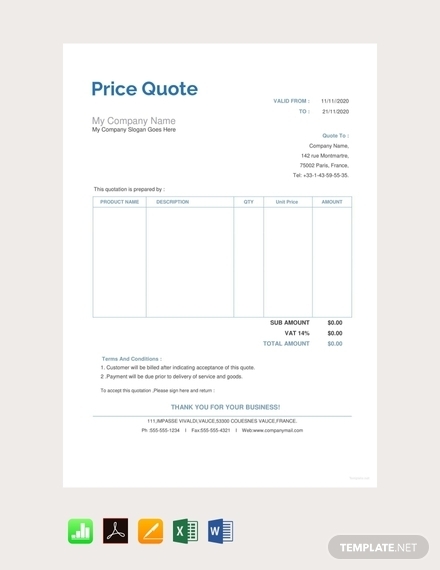 A quotation is a formal statement of promise that is sent by a potential supplier to a buyer. Specific details about the agreement are cited in the document before both parties may push through with the sale. 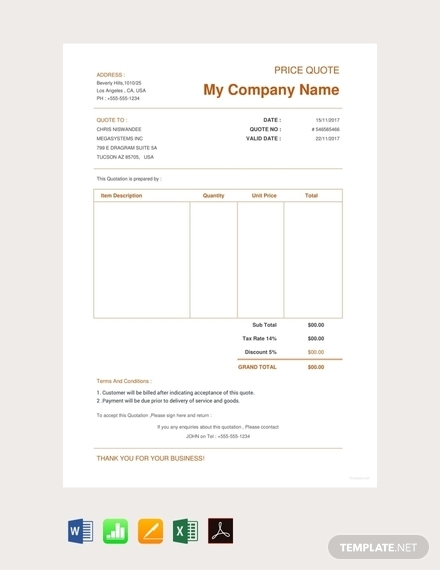 Unlike an invoice, a quotation is prepared by the supplier at the request of a buyer to present the price, quantity, and terms of sale of a product or service. 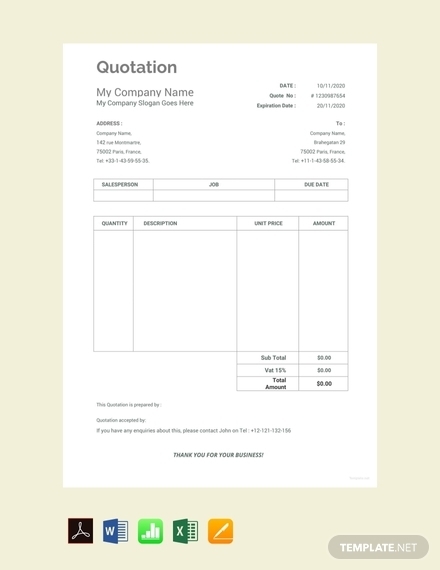 When do you send a quotation? 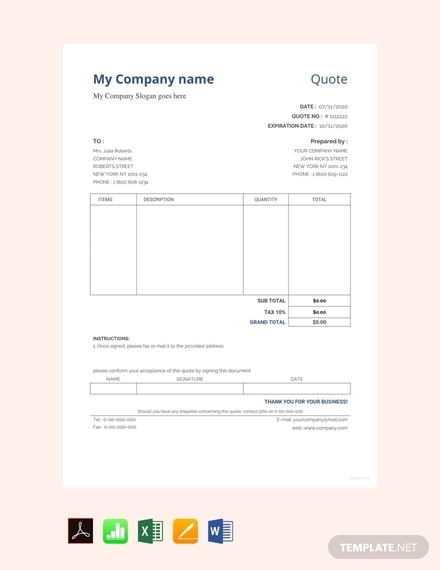 Prior to a sales receipt and a sales invoice, a quotation proposal is sent by the supplier to provide a detailed summary of the items availed by the buyer. In most cases, suppliers are open for negotiations, and the total cost of the project is subject to change after some considerations. 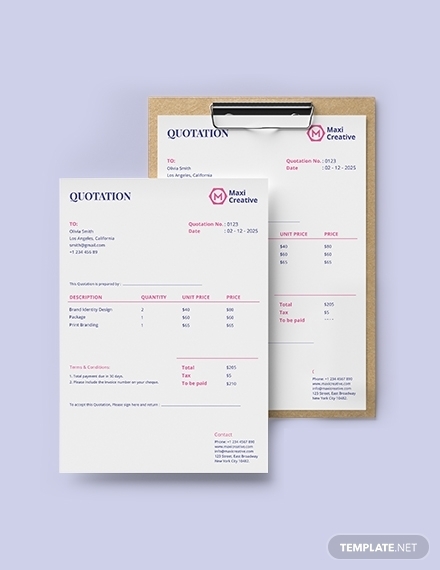 Quotations are a key tool in closing a promising deal with a potential customer. 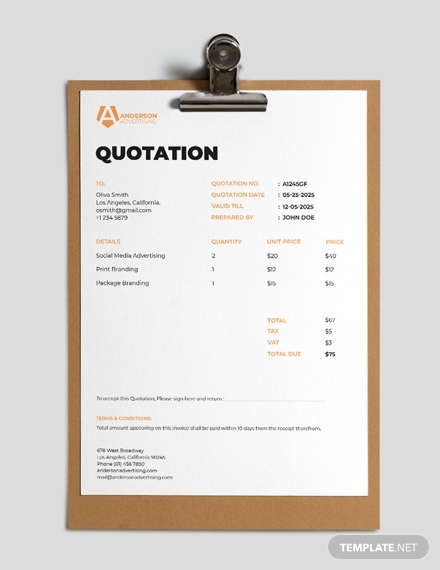 By writing clear and accurate quotations, you’re sure to engage prospects and secure better opportunities for your business.